USB Show is a free tool that allows users to recover files hidden by someone or by a virus or malware. 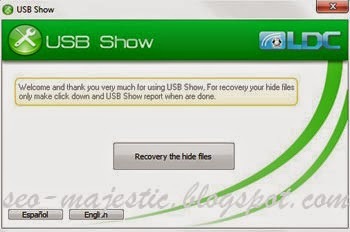 USB Show can find any file on a USB stick, flash drive or internal hard disk. This application is portable and users usually highlight this feature for the comfort of running it wherever you want. When you download it, you will notice that it has a very small size, it’s really useful and besides, it can operate in any computer without any kind of previous installation. This application is quite easy to use, and generally, it works really powerfully. Its efficiency stands out for recognizing a great amount of hidden documents by different viruses in the same USB. In fact, you can also run it in hard disks, but be conscious that this process takes much more time. It uses a ‘one-click’ process to recover, which consists in having just one button to scan. Its interface looks clear and really intuitive even if you’re a beginner. Besides, you have the option of choosing the documents or folder that you want to analyze. In general terms, this tool is really complete, useful and easy to use, but it takes too much time in doing the scans.